Are you in need of a propane supplier? Perhaps you are dissatisfied with your current propane supplier. Or maybe you recently bought a home with a propane furnace and you’ve never had one before. Maybe you are considering having a propane furnace installed in a new home or switching to a propane furnace from a different heating fuel. Whatever the reason, you want to find an affordable, reliable propane delivery service in Burlington. But what qualities should you look for in a propane supplier? Safety. The most important quality in a propane delivery service, safety records are a great way to start. A reputable heating fuel supplier should be able to provide you with references. Suppliers are most likely involved in safety programs that can further attest to their emphasis on safe practices. Better Business Bureau Accredited. If you want to find out about a company’s customer service history, the BBB is a great resource. The BBB gives businesses a letter grade rating based on a number of criteria, such as customer complaints and resolution, business practices, and government action taken against a business. Look for a propane supplier with an A+ rating with the BBB. Experience. Choose a supplier with plenty of experience. If a company has been in business for a long time, they must provide excellent customer service. Otherwise they wouldn’t be in business today. And a company with experience can be trusted to do the job right. If you sign up for a delivery plan, the company will know how to calculate your usage and be sure to refill your tank before you run out. Heating fuel supplier and HVAC service in one. A propane supplier who can also repair your furnace is quite convenient. You can combine your yearly furnace maintenance with a propane refill. Every year before the winter cold sets in, your HVAC company/propane supplier can give your furnace a tune-up and refill your propane tank to get you all set for the heating season. Combining these two services will save you money. Alamance Oil Company exceeds all of the above criteria. 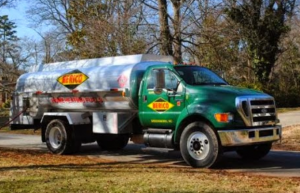 Serving Burlington and the surrounding area since 1924, we have the experience necessary to safely deliver your propane on time. We are A+ accredited with the Better Business Bureau and we were awarded the Super Service Award by Angie’s List. We offer service plans that include propane delivery discounts. New propane customers enjoy special pricing and free tank swap out if you are switching suppliers. We deliver 24 hours a day, 7 days a week in case of emergency. By switching to Alamance Oil you can save up to $150 a year. Schedule fuel delivery or call 336-496-2509.